Mahogany and steel single drawer table desk. Designed by Hans Eichenberg, made by Haussman and Hausmann fo Stendig. Top quality craftsmanship and materials. Pair of modernist, 1970s acrylic, polished chrome, and brass wall sconces. Rewired and ready for use. Price is for the pair. Brutalist sculpture table lamp designed by Harry Balmer for Laurel Lamps. 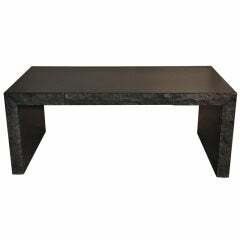 As shown, measures 51"H. Sculpture base measures: 35.5". 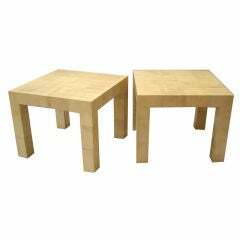 Matching pair of goatskin clad end tables or bedside tables. Designed by Karl Springer. Top quality materials and construction. Ready for use. Price is for the pair.